As the Dark Souls series comes to its probably-temporary end, its presence in our lives remains a fascinating phenomenon. The collective of games popularly known as Soulsborne – consisting of Demon’s Souls, the Dark Souls games, and Bloodborne – seems, at the same time, ubiquitous and esoteric. Almost every video game veteran is familiar with it, and yet it remains a niche fascination, the topic of obsession for a dedicated group of fans and a shorthand for cruel, punishing difficulty for the gaming public at large. To a great extent, this is a fault of marketing, with Dark Souls’ Prepare-to-Die image doing more harm than good in the long run. (The poor play conditioning of early games didn’t help, either.) And yet, some of the best Soulsborne moments happen once combat dies down, when walking around, taking in the environments, talking to NPCs and trying to make sense of the madness of everyone and everything around you. While this is an aspect that was sorely lacking in Dark Souls III’s base content, I am glad to tell you that The Ringed City takes full advantage of the game’s potential for storytelling, making it the first in the series to combine DSIII’s technical polish with the brilliant world-building of Bloodborne. The result is some of the best moments of the entire Souls series. Whatever one thinks of Soulsborne as a whole, it’s hard to deny that From Software makes some damn fine DLC, and The Ringed City is no different. As usual, the expansion takes place in a distinct setting. 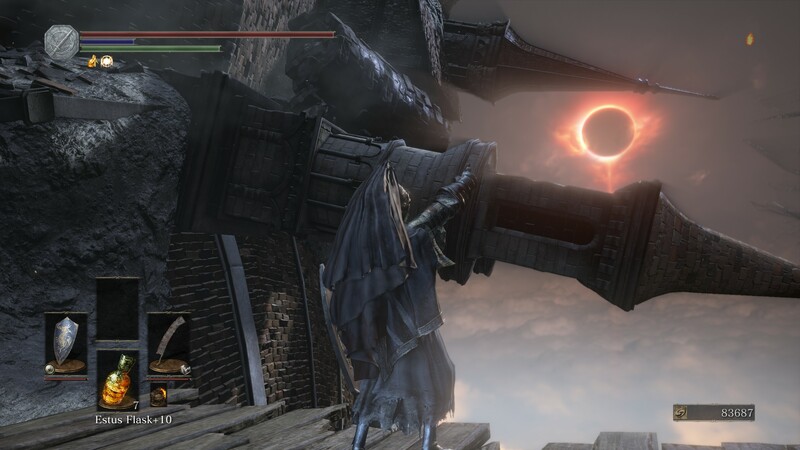 Using new bonfires found next to the final boss room of either the base game or the Ashes of Ariandel expansion, players will access the Dreg Heap, an amalgamation of worlds brought about by the end of the Age of Fire. The atmosphere is weird and alien, with an architecture and a bestiary that fully express the decay and ruin endemic to this area. 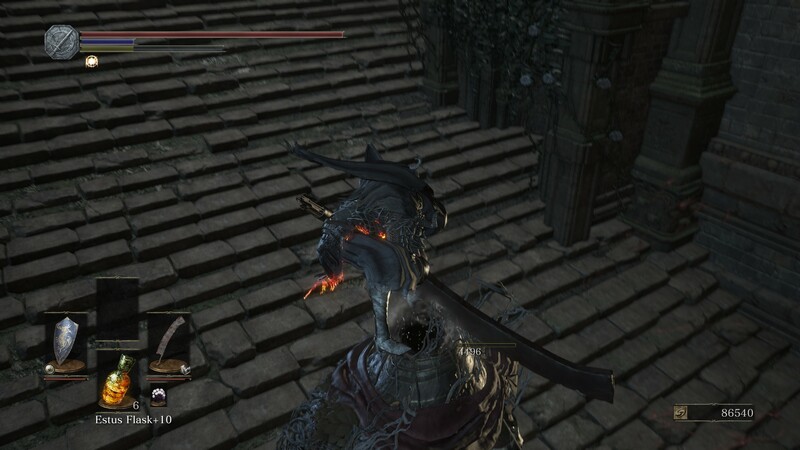 A large part of the joy of Dark Souls – if joy could be used in this context – is discovering the details on your own, and so, I am loathe to say much more. Suffice to say, it is a far cry from the sleek, gaunt feel of most of DSIII. From here, players will proceed to discover the mysteries of the Heap and the eponymous Ringed City, with lore that references other games in the series, both directly and indirectly, in pleasingly effective ways. Well, for the most part. The choices of which stories to reference are at times quite bizarre, and I have yet to decide if some of them are absolutely brilliant or just jumping the shark completely. Either way, the game cannot be accused of being predictable. It’s rightfully uncommon for expansions to add much to gameplay, and The Ringed City certainly preserves DSIII’s core mechanics. However, with some creative use of verticality and sprawling level design, parts of City feel surprisingly fresh, adding elements of puzzle and almost platforming to the affair. Certain parts have players contend with an airborne aggressor who cannot be easily defeated, forcing one to creatively use cover to advance. Others face you with enemies that, while weak, can do massive damage to stationary players in line of sight, making it imperative to find quick ways to get to some hard-to-reach spots. The shift to this more dynamic brand of gameplay, no doubt inspired by Bloodborne, started with the base game, and The Ringed City fully embraces it, especially when it comes to the boss fights. Whether monstrous or humanoid, bosses are fast and aggressive, and those who focus too much on retreating and blocking are likely to be felled quickly. Dodging and keeping up an offensive is the way to go, making combat a true thrill while still maintaining a very Dark Souls feel. Which is why, perhaps more than ever before, DSIII’s persisting limitations are glaring. Any combination of blocking and dodging remains a finicky mess, and the sort of finger gymnastics needed to move around effectively while running is no more fun than it’s ever been. City mostly works around these limitations, which is commendable, but they remain an annoyance. Of course, the more frustrating annoyances are the ones that could’ve easily been avoided. The most obvious one is the persistence of large, empty corridors one needs to navigate to reach some bosses. I fail to see the point in forcing me to do a lot of uneventful schlepping just to get to a rematch. City also employs one of my biggest pet peeves in gaming: bosses who come with generic minions who do little more than pester you. Add to this the game’s already less-than-stellar lock-on mechanic, and you get a fight that’s more annoying than difficult. Thankfully, such annoyances are few and far between. For the most part, I’ve been pleasantly surprised by how effectively The Ringed City sidesteps some of the bafflingly bad design choices that have plagued most games in the series. City also has more mundane additions in store for players. There is a whole host of new weapons and armor to try out, and while some weapons, like the Splitleaf Greatsword, feel flimsy and underwhelming, most of the new gear is great fun to use, with much Fashion Souls potential in some of the new pieces of armor. Although I’ve had my ups and downs with Soulsborne, and while I do feel like From is right to end it at this point, it’s hard not to feel wistful at the end of The Ringed City. But I believe this will be easily remedied, because – and this is probably the biggest compliment I could pay the game – City is so good at showing the strong points of Dark Souls that I already feel like going through the series again. And this time, knowing where it all leads to, I think I’ll actually enjoy getting destroyed by that one boss.